Material: 65% Cotton & 35% Polyster. Occasion: Summer, Spring, Fall, Beach, Shopping, Vacation. S US(4-6) Chest: 33.4 Inches, Length: 54.3 Inches. M US(8-10) Chest: 35.4 Inches, Length: 55.1 Inches. L US(12-14) Chest: 37.8 Inches, Length: 55.9 Inches. XL US(14-16) Chest: 40.5 Inches, Length: 56.7 Inches. 2XL US(18-20) Chest: 43.3 Inches, Length: 57.4 Inches. 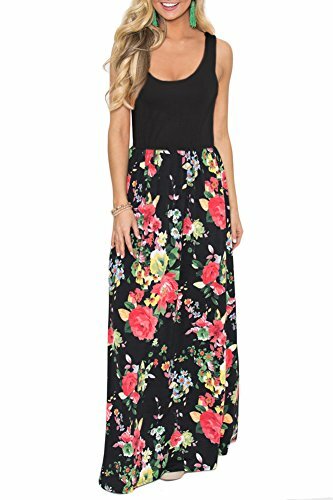 Women's Summer Sleeveless Floral Print Tank Dress with Pockets. Floral Flared Swing Casual Skirt with Side Pockets. FLORAL MAXI DRESS - This Gorgeous Floral Maxi Dress is Such A Must-have for The New Season! From The Vibrant Colors to The Flowy Feel, It is Sure to Be Your New Summer and Fall Favorite! SIZE INFORTMATION - S US (4-6), M US (8-10), L US (12-14), XL US (16-18), 2XL US (18-20). Detail Refer to Sizes in Product Description as Below. FLORAL DRESS - Featuring A Dazzling Combination of A Solid Bodice Paired with A Beautiful Floral Maxi Skirt - It's Such A Beautifully Bright Addition to Your Closet! The Bodice Features A Sleeveless Cut Paired with A Scoopneck for A Timeless Style, While The Long Maxi Skirt with Side Pockets is So Breezy and Fun! The Material is So Lightweight and Has A Little Stretch for The Perfect Fit! And We Love The Flared, Casual Skirt - It's Made for Relaxation! CASUAL CLOTHING - You Can Easily Keep it Casual With Sandals and A Floppy Hat, or You Can Dress it Up with Wedges and A Sparkling Necklace! CUSTOMERS COMMENT - "I absolutely love this floral dress. It's super cute, light, & very flattering. The colors are amazing and I've had a ton of compliments on it! the colors and pattern are vivid and gorgeous. Love the dress! Great for summer, very light material for hot days! I am looking forward to having this beautiful dress for vacation."